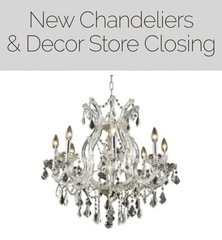 M21693 Fine home furnishings, lighting, and decor store is closing and will liquidate high end European and Asian decor assets. AUCTION CLOSING DATE: Sunday, June 24th 7:07 pm. Bidding closes on the first item at 7:07 pm, then closes at the rate discussed in these Terms and Conditions of Sale.